Essential oils (EO) are natural oils derived from plants that retain the plant’s characteristic fragrance and other therapeutic or medicinal properties. There are two main ways that a plant’s essential oil can be extracted: distillation or cold press. Distillation is the most common process and uses either water or steam to break down the plant material into its basic components where the oils can be separated from the water and plant material. Cold pressing is a form of expression where a weight is put on top of the plant material and literally presses the plant until the water and oils are released. The oils are then siphoned off and collected. This is most commonly performed with citrus oils but also with carrier oils such as Olive or Coconut oil. So why do we use essential oils? Most essential oils have properties that can help fight germs and support the immune system (despite many research studies that indicate that essential oils can prohibit the growth of bacteria and fungus and may even protect individuals from contracting viruses the FDA is very specific about what we can and can’t say). Essential oils have been used for centuries as holistic remedies. As a result, these properties make essential oils wonderful additions to homemade cleaning products. Oils such as tea tree, lavender, peppermint, eucalyptus, and lemon are excellent for cleaning! Essential oils are also well absorbed by the skin and are also good choices to add to beauty products intended to help heal, nourish, or soften the skin. Oils such as tea tree oil are wonderful for eliminating those pesky acne breakouts. Add some lavender, rosemary or ylang ylang to your hair products or rose geranium or sweet orange to homemade lotions and moisturizers. But all essential oils are not created equal. 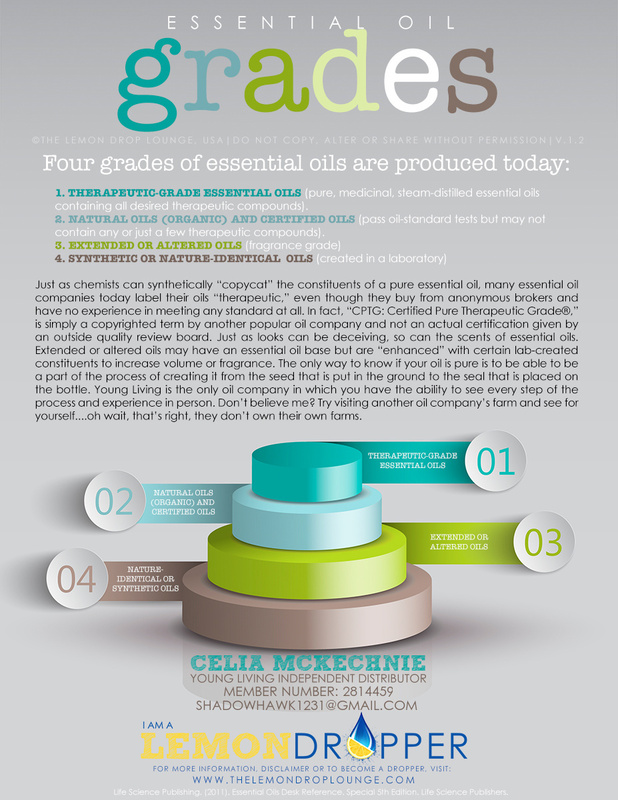 There are 4 “grades” of essential oils that are on the market today: 1) therapeutic grade – pure, medicinal quality oils containing all the desired therapeutic compounds of the mother plant; 2) natural (organic) and certified oils – pass oil standard tests but may not contain all the desired therapeutic compounds of the mother plant; 3) extended or altered oils – these are also known as fragrance grade oils; and 4) synthetic or nature-identical oils – these are man-made vs plant derived. It should be understood that the FDA does not regulate oils the same way it regulates pharmaceuticals and that there is no agency oversight certifying what “grade” an oil actually is. Therefore, the term “therapeutic grade” is really more of a marketing strategy than an actual grade of essential oil but there is some benefit to understanding what this term means in the retail world. What “therapeutic grade” oil is generally understood to mean is that the product is “genuine and authentic, plant derived, preferably organic or wild crafted, unadulterated [no additives, no extenders, no price reducing ingredients, no nothing except what was there after distillation or expression] essential oils” (Shutes, The Quality of Essential Oils). Another term you will hear thrown around in the EO world is “Generally Regarded as Safe (or GRAS)” which means that the product meets minimum food additive guidelines set forth by the FDA. “Under sections 201(s) and 409 of the Federal Food, Drug, and Cosmetic Act (the Act), any substance that is intentionally added to food is a food additive, that is subject to premarket review and approval by FDA, unless the substance is generally recognized, among qualified experts, as having been adequately shown to be safe under the conditions of its intended use, or unless the use of the substance is otherwise excluded from the definition of a food additive” (Shutes, The Quality of Essential Oils). GRAS as a term includes both natural, organic oils as well as adulterated, synthetic oils and chemicals and provides no indication of how the plant was grown, harvested, or distilled or the quality of the oil itself. Take caution and practice using essential oils safely. • Most essential oils should never be used undiluted on the skin. Instead they should be used with carrier oils (olive, jojoba, coconut, etc. ), waxes (beeswax), butters (cocoa, shea, etc. ), alcohols, or other diluting methods. Essential oils are so concentrated and powerful that using an oil undiluted on the skin may wind up with unforeseen reactions. • Some essential oils are widely regarded as safe to be used undiluted, or “neat,” on the skin. These include lavender, German chamomile, tea tree, sandalwood, and rose geranium. However, there are always exceptions to the rule so use any undiluted oil with caution. • You should always do a patch-test with any new oil to ensure that it will not bother your skin. A patch-test is usually done on the inside, upper portion of your arm. Begin by combining 1 drop of your essential oil with ½ tsp of a carrier oil of your choice, rub onto the skin and wait 1 hour. If no itching or redness occurs you are most likely not sensitive to that oil. • Never use an undiluted oil on a baby or child. Children’s skin is much thinner and more sensitive than adults. As a general rule, if you are making a recipe for a beauty or skincare product that you will be using on your baby or child you should only use HALF of the amount of the essential oil, even when diluted. A great resource for using essential oils with babies and children is the book Gentle Babies (buy it here:http://www.amazon.com/…/p…/0981695485/ref=ox_sc_act_title_2…). • Many essential oils should be avoided if you are pregnant or nursing, including: Aniseed, cedarwood, chamomile, cinnamon, clary sage, clove, ginger, jasmine, lemon, nutmeg, rosemary, sage. View a complete list here: http://www.essentialoils.co.za/pregnancy.htm. In addition, it should be noted that peppermint eo has been known to decrease milk supply in nursing mothers and should be avoided as a general rule (although I do use my homemade toothpaste with peppermint eo daily and have had no adverse reaction to my supply). • Ensure that any oil you ingest is grown organically, is of “therapeutic grade,” that it is “generally regarded as safe” by the FDA, and that you have fully researched the oil’s risks and benefits before deciding that using the oil as a dietary supplement is the right choice for you. I’ll be honest, I’m a little wary of and caution against ingesting essential oils without doing your research. I would have to trust my source implicitly (see my post Why I Chose Young Living Essential Oils) before deciding to use any oil as a dietary supplement. • And as always keep any essential oil out of reach of children or household pets. While some oils can be used with pets many are toxic and should be avoided (more on this later). I also love Crunchy Betty’s blog for tips and recipes on homemade home and beauty products. She was a big inspiration when I got started. Sadly she no longer writes her blog as she spends her time writing books (Crunchy Betty’s Food on Your Face for Acne and Oily Skin – buy it here:http://www.amazon.com/Crunchy-Bettys-Food-Your…/…/B005PBP3DI) and making and selling her homemade beauty supplies now. You can check out her blog archives at http://www.crunchybetty.com/ or join her Facebook community group Naturally – Crunchy Betty athttps://www.facebook.com/groups/crunchybetty/. Categories: Essential Oils and Aromatherapy, Intro to a Natural Lifestyle | Tags: chemical free, DIY, essential oils, natural lifestyle, non-toxic, young living | Permalink.